Tennis players need a very good level of speed, agility and endurance. Great speed and agility categorize the champion tennis players of today. Polls on this site have also confirmed that speed and agility are considered the most important for success in tennis. Aerobic (endurance) fitness is also very important for tennis players for maintaining the playing intensity throughout long games, matches and tournaments. 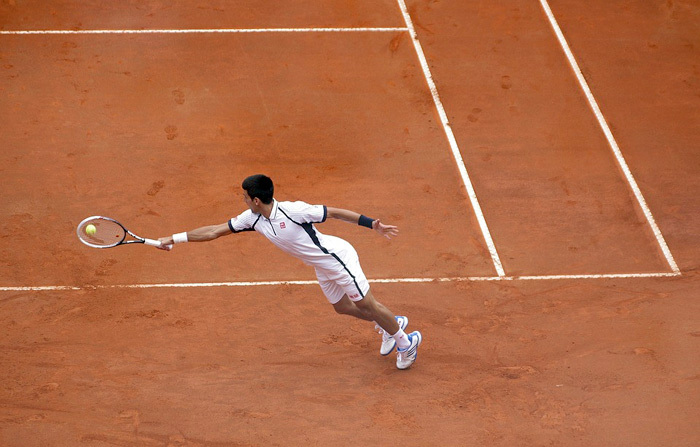 Other fitness components also important for tennis are anaerobic capacity (repeat sprint ability), power and flexibility. See our discussion of Fitness Components for Tennis. Regular training is required for all areas of fitness. An effective training program starts with a good plan. The training should be directed to achieve specific goals and be individualized to address the strengths and weaknesses of the player. In order to improve, the physical load needs to be increased over time as they player get fitter. By using cross training and by incorporating fitness into the training drills it will keep it interesting and maintain the motivation. Read more information about training for sports. Fitness assessment can be used to determine the fitness level of tennis players at the start of a training period, and to monitor changes in fitness in response to the training. Check out this suggested list of fitness tests for tennis players. Who is the Fittest Tennis Player? more about anthropometry for tennis.